Third in our December series of women’s sports, rowing! Read on for the health benefits of rowing, the local rowing clubs, and women’s rowing as a professional sport. Rowing is about strength, cardio and flexibility. A low-impact form of exercise, it strengthens muscles and joints throughout the body without the strain of weights or sweat of jogging. You can row at your own pace, and you can row on your own or with a team; at the gym or across the river. …And because it’s fun. Here are some more reasons, compiled by rowing brand Concept 2. Try out the rowing machine at your local gym, or else select your state on this page to find your local club. What is women’s rowing like on a professional level? 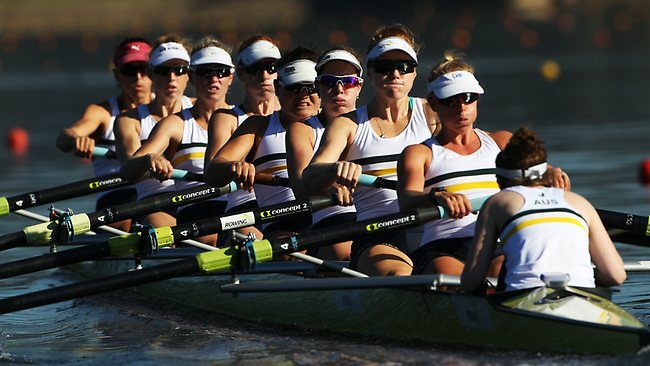 Australian women’s rowing was rather successful in the 2012 London Olympics, scoring two silver medals in the team events and one bronze in the individual events. One athlete to watch is Kim Crow, who took home two of those medals. What’s your ultimate summer sport? Can women play it professionally? This entry was posted in Culture and tagged olympics, rowing, sexism, sport, women's sport. Bookmark the permalink.